As the Technical Advisory board members of LeanSpoon, Dr. Latha and Dr. Avanti, advise us and shares best practices in Nutrition, Hygiene and food production. Their aim is to make LeanSpoon a model for preventive healthcare. We are really happy to have them on board and their contribution is a great value addition to the LeanSpoon team. Dr. Latha has about 25 years of experience with several hospitals where she focused on nutrition for in-patients. Her entrepreneurial journey includes starting a lifestyle wellness management consulting along with her colleagues. A PhD in Foods and Nutrition, she has written many Articles and papers on the subject. She is also a Guest faculty at NIN and has been the president and a life member of Indian Dietetic Association, NSI and AIAARO and an India Representative in ICDA. Her contribution to this field has been awarded with at the 16th International Congress of Dietetics, Sydney in 2012, Indian Dietetic Association – 44th National Conference – A N Radha National Award in 2011, The Nutrition Society of India – Outstanding Young Scientist Award. Dr. Latha is as passionate about the subject as she is strict in its implementation. Dr. Avanti has about 30 years of teaching and research experience in the field of Nutrition. As a HoD of Nutrition Dept, she has created a talent pool of nutrition experts by establishing Nutrition departments at various colleges. She has been the Vice President of Indian Dietetic Association, A.P. Chapter and is a Life member of Nutrition Society of India and Indian Dietetic Association. With a PhD in Biometry and Nutrition, not only has she significantly contributed to the science through articles and research, but also takes time to help students in M.Sc projects, plan UGC Syllabus, and give talks on Nutrition at Schools and Institutes. She is actively involved with various NGOs and focuses on improving the knowledge of nutrition among various sections of the society. She is warm at heart but does not hide her disapproval of baseless ‘Nutrition Fads’. Gopi always insists that there is a chance to imagine, try and create something new. To challenge every presupposition and to believe that there is no predefined way to do anything is his method to make LeanSpoon flow. Making full use of his self-proclaimed 'repository of pointless knowledge', Gopi's ideas are easy to understand because of the clarity and passion with which he shares them. As a well-travelled Global citizen with an Indian soul, Gopi is determined to use all his experience in business processes, logistics and exposure to multiple cultures to impact access to nutrition advice and food in India. Saneesha cares about every detail of everything that happens at LeanSpoon, with the kind of attention that a painting requires. Not surprising because she is an accomplished painter. She motivates everyone in the company regardless of how busy she is and knows that every moment is a good one for a laugh. Sometimes one wonders if she is laughing with you or at you. With a Masters in Computer science and experience across different fields, she is known to approach problems with an open mind that dives deep. She brings a unique approach to food – which she insists needs to be fresh, interesting and free of artificial chemicals. 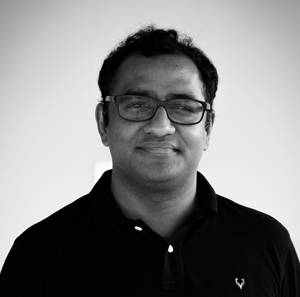 After 8 years of experience in different types of cuisines such as five star hotels, Australian cruises and well recognized airlines, Sandeep Reddy came to lead the exciting laboratory of LeanSpoon. ‘LeanSpoon offered me to join a project based on a totally new concept which immediately caught my attention, this mix of culinary blend with nutritional sciences was a field that I never explored before but my multiple years of experience have properly prepared me for this position. I am ready to guide the wonderful team that LeanSpoon has built on its kitchen and get the best out of each one of us’ With his young face it would be almost impossible to recognize Sandeep within the rest of the team as the head of our kitchen. Experience and talent goes beyond and he is the clear example. Sravya is the clear example that there is no excuse to not have energy each day. She is the eyes and hands of LeanSpoon when it comes to finding the best people. Accomplished master in business administration with human resource management as key focus and experience on this field, she is constantly hunting for the right people, not just talent or experience, but also a cultural fit. "Leanspoon gave me the opportunity to be involved and take leadership of all facets of the HR Function. It has been a truly fulfilling experience"
Our aim is a 'Healthier You', through a 'Healthy Lifestyle'. We started last year in Hyderabad, through the insistence of the founders to ensure access to reliable nutrition information and healthy food. LeanSpoon has grown in vision and team. This expert team has reimagined the path to healthier, happier you connected to your goals. We want to make a healthier you possible, simple and fun! There is more to a healthy lifestyle than pre-packaged plans; after all each body is unique, and each one of us has a unique health goal too. A dedicated nutritionist to guide you every step of the way, every day. Our food tastes awesome, and it’s nutritionally balanced. The plan is Hyper-personal: everything we do is connected to your individual health goal, may it be weight loss, getting that 6-pack or preparing for pregnancy. It is also connected to your health background – think preventive healthcare.